Editor’s Note – This is Part IV of the five-part Real Estate Lead Generation Special Report a.k.a. the Local Zillow. Part I – What’s Your Biggest Real Estate Marketing Problem? If you’re really serious about solving your lead generation problem and taking back your town or neighborhood from the large real estate portals, you need to build your own real estate portal. I warned you that this was a big project! The next step in the Local Zillow project is to build a real estate portal that publishes the public data available for every piece of real estate in your local area. Not just active listings for sale. Every single home in your local area, including the off market homes! If you have 10,000 homes in your town that adds up to a huge amount of data capture. Just keep reminding yourself that the obstacle is the opportunity and that you will have the most dominant real estate website in your local market. It’s easy to build a WordPress website but surprisingly difficult to build a real estate website that you can use to create your real estate portal. The primary problem is adding listing data that can be quickly and easily searched on your website. Most cheap out the box real estate themed solutions, like Placester or Zillow, are IDX dependent and make it difficult to add your own listings. The workarounds or hacks get complicated and always end up breaking your site. The absolute best solution would be to purchase or subscribe to an MLS software system. There are a number of MLS software providers who sell their software to the MLS and will also sell their software to you – but the price is way too high. The solution that I came up with lies on the more affordable side but lacks the sophistication of the MLS or the tools and utility of the big portals like Zillow. But it is very affordable, simple and effective for our local project. After all you’re not trying to offer the great user experience you get with Zillow or the deep market data that you get from your MLS. You just want to show a nice photo and about 12-15 data fields for each home in your market. My solution was to use the Equity framework from Agent Evolution. The Equity framework is a proprietary WordPress theme that was developed by Agent Evolution. You may remember Agent Evolution as a website development company (Nicole Nicolay) that was bought out by IDXBroker. The key to the Equity framework is that it is a real estate specific framework with a number of “child” themes that you can use to change the look and feel of your website. The framework also has a number of plugins and listing templates that you can use to show case each neighborhood, subdivision and home on its own page. The most important thing is that it functions independently of the IDX plugin and allows you to add your own listings. Each listing has its own page and is searchable through their search tool. Agent Evolution currently offers three pricing plans and website services. Plan 3 is that they’ll set it up for you for $299 and then provide hosting, maintenance, IDX and support for $99 a month. Click here to view the current plans and pricing. I went with Plan 1 and purchased a developer license that allows me to develop an unlimited number of my own sites and client sites. This means I can build your site (if you’re really nice to me). I use GoDaddy.com. You need to remember to change your name servers to point to your hosting company. Media Temple has a 1-Click App that makes it easy to install WordPress on your server. You can purchase the Equity Framework and Real Estate Themes from Agent Evolution. You need to buy both the Equity Framework and the theme or theme package. The theme package only works on the Equity framework. There’s a learning curve to understand the full functionality of the themes but the video tutorials are excellent and easy to follow. You also need to purchase the Listing Templates from Agent Evolution. The templates are just $25 but they’re tricky to install, as you need to upload them as .php files. You need to add the following plugins. Agent Evolution has a number of listing and custom menu widgets that you can add to your website. You have two main menus – a top right and a home menu. I then create an individual page for each neighborhood, each real estate type and for each report. You need to create a number of reports that you can give away in return for an email address. This is a critical piece of your website and requires that you both know your market and design beautiful reports. Start writing your first posts using the “Photo and a Paragraph” method. Take a photo and write a paragraph about it. Go to your property database and look up the list of neighborhoods. Agent Evolution calls them Communities. You need to add every neighborhood and create a page for each neighborhood. If you live in a small town then add every subdivision if you don’t have clearly established neighborhoods. Adding neighborhoods is a strong SEO play that will help you drive traffic to your portal. This is where all the work piles up, as you need to create a new page for every home in your area. There’s no way around this – you (or someone you hire) needs to drive around town and take a photo of the front of every single home. An iPhone works just fine. You need to own the photo. You can’t scrape them off the MLS or another website. Then upload each photo to your media section, making sure you name the file exactly the same as the street address, and then set the photo as a featured image on your listing page. You can’t build a real estate portal overnight. It takes time, resources and the real desire to understand your local real estate market. You can’t pretend to be the local market expert. The good news is that we have the technology and tools to build the portal in a relatively short period of time. That’s because we can automate much of the process and create the listing pages from a database upload tool. But ultimately the main reason we want to own our own real estate portal is because we know it works. You only need to look at Zillow, and their $4 billion market cap to understand that smarter minds than ours have already broken the code. If this makes sense to you and you need some help, send me an email at ross@remcamp.com. 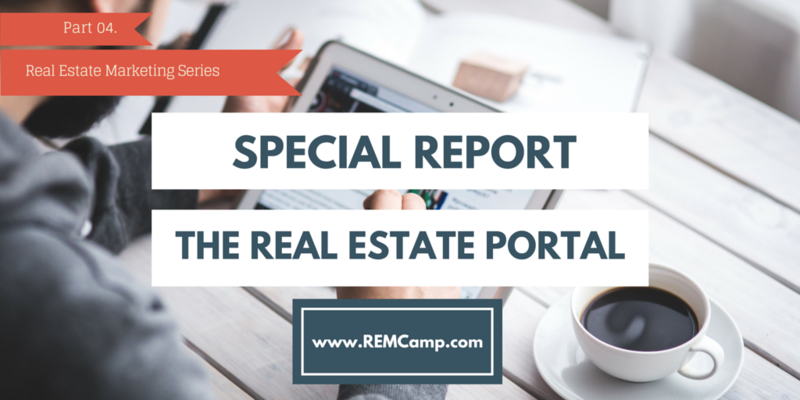 And don’t forget to read part V of the Real Estate Lead Generation Special Report, a.k.a. the Local Zillow, where we show you how to add a homeowners portal to the back of the real estate portal. REMCamp is a digital marketing training site for the real estate community.